Larry Seibert of Ben Franklin Tech Partners, Kevin Langdon, CTO and Brian Monnin, CEO, of Ben Franklin Venture Idol winner and StartupLewisburg member Play Impossible; and Dennis Hummer and Steven Stumbris of Bucknell’s Small Business Development Center and StartupLewisburg. 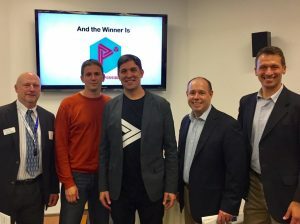 Play Impossible Corporation, Lewisburg, won Ben Franklin Venture Idol, hosted by the Ben Franklin Technology Partners of Northeastern Pennsylvania (BFTP/NEP), on Thursday evening, November 3. The event was held at the Innovation Institute in Ben Franklin TechVentures®, BFTP/NEP’s award-winning and LEED Gold-certified technology incubator/post-incubator on Lehigh University’s Mountaintop Campus. Ben Franklin Venture Idol is a cross between Shark Tank® and American Idol®. The event illustrates a significant way in which early-stage entrepreneurs seek and obtain seed capital. Venture Idol, which included pre- and post-event executive networking receptions, was sold out again this year. Eight entrepreneurs were selected as competitors. In addition to Play Impossible, the 2016 Ben Franklin Venture Idol competitors were Brighton Training Group, Lewisburg; Care Technology Solutions, Ben Franklin TechVentures, Bethlehem; Eventuosity, Ben Franklin TechVentures, Bethlehem; Howell Benefit Technologies, LLC, Wilkes-Barre; MindMe, Inc., Ben Franklin TechVentures, Bethlehem; Signallamp Health, LLC, Scranton; and webCemeteries.com, Virginville. Three of the eight start-up technology companies: Howell Benefit Technologies, LLC, Wilkes-Barre; Signallamp Health, LLC, Scranton, and Play Impossible Corporation earned their way to finalist status in a round of judging in the afternoon of November 3rd. Following a networking session beginning at 5:30 PM, the evening event began with a keynote address by Rolf Schlake, President and Chief Executive Officer of Ben Franklin client Applied Separations, Inc., Allentown. The three company finalists then pitched their ventures to investors and the audience. After short critiques from the panel of investors, the audience members “funded” the companies, crowdfunding style. With $100 of “Ben Bucks,” each guest distributed his or her “investment dollars” in whole or part among the three finalists. Ben Franklin will award $15,000 in real dollars to the companies based on the audience vote. 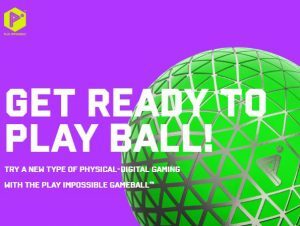 The Play Impossible Gameball™ is a multi-sport “smart ball” that provides connected games designed to keep five- to 15-year-old boys and girls challenged, entertained, and moving with active play. The 10-inch-diameter ball is for indoor and outdoor recreation and will contain sensors, a microcontroller, Bluetooth radio, and ultra-capacitor. It will use a battery-powered, hand-held charger and will connect via Bluetooth to Android and iOS applications.